The more people that know about your fundraising event or activity, the more successful it's likely to be and the more you’re likely to raise. If you’re looking to raise a significant amount of money, you’ll have a greater chance of success if you spread the word wider beyond close friends and family. Publicising your event will help you to reach a far wider audience. Here are some tips and ideas on getting the word about your fundraising activity out there. 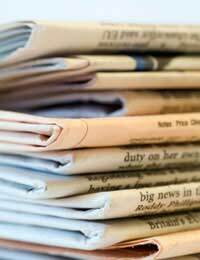 Press releases are sent to newspapers, magazines, websites and radio stations in the hope that the press will pick up on the story and run an article on it. There are loads of examples of press releases online. However, there is an art to writing a good press release. It may be worth contacting a local PR company or individual who may agree to write a press release for you as it’s for a charitable cause. Additionally an established PR professional will have many media contacts already. If you decide to write the press release yourself, find out from the publications who the best person to submit to is. Include a snappy headline, details of exactly what is going on, where and when. Include a quote which sums up the importance of the cause and any other persuasive information. Local media are most likely to pick up on the story. However, if you’re doing something particularly unusual or have a media-friendly story, you never know - your event or activity could receive some national coverage. Send a good photo with your press release. The media can always follow up and ask for more details or to send a photographer but the more of a complete the package you can send the better. It’s also a good idea to raise publicity for your event or activity yourself. There are lots of ways you can do this, beyond telling as many people as you can verbally. Make a website: There are now many easy to build sites which are free or cost a minimal amount of money and require very little technical skill. Having a website for your event can be a good way to provide information to prospective donors and could even have a facility to donate online. Links to other relevant sites and charities could build traffic. Include information on the event/activity, the charity and how much you hope to raise. A blog is also a good way to keep people up-to-date with your progress and any news. A blog could also be an additional way to raise money. See our article on ‘Fundraising ideas for bloggers’. Make posters and flyers: Eye-catching posters and flyers distributed around your local area can really help raise awareness of your event or activity. Make sure the posters and flyers are striking and also clear and easy to read. Include clear details of the event or activity time and place as well as any website address and further contact details. Use social networking: Online spaces such as Facebook, Second Life, MySpace, Twitter and chat forums can help you spread the word about your fundraising activities quickly and widely. This type of publicity-raising activity costs nothing and the sites are easy to use.